Last Minute Ethical Gifts Under £30! With a week until Christmas, there’s still time to grab some great Ethically produced Christmas gifts! I’m sharing my favourite ethical gifts under £30, which if you hurry can still be delivered in time for Christmas. You can’t have Christmas without Chocolate in our house! A very dear friend introduced me to The Raw Chocolate company, they make Vegan chocolate, most of which is organic and fair trade too. Top of the list to try this Christmas is their award-winning Chocolate Almonds! Green People are a brand I really love, I’ve used their products for a few years and I won’t use anyone elses sun cream on my children’s skin. Their products are really kind to skin, and I find their make-up is brilliant on my sensitive skin! On my “to try products for 2017 is their mascara which a friend raves about, but I’ve not got round to trying. Green People this year have a range of organic stocking fillers in beautiful Butterfly packaging. The sale of each will give a donation to the Butterfly Conservation, which helps protect British Butterflies. These are great little gifts, priced under £10. There is no excessive packaging, the outer cardboard can go straight in the recycling. I love the indulge night cream one in particular, as over Christmas I find my skin care routine can get a little erratic! This little gift is ideal to remind me to indulge my skin before bedtime! Green People products contain no nasty chemicals. Their products are Organic and they pride themselves on using Fair trade ingredients. They donate 10% of their NET Profit to charitable causes. They’re not out until next year, and are rather over the £30 budget BUT.. Po-Zu sell gift cards! Yes, I may have asked everyone I know for a Po-Zu gift card this year! I already own a pair of Piper Boots, but not the Star wars ones! I can say that they are the most comfortable boots I’ve ever owned! Sophie la girafe skincare makes a lovely gift for a new baby! New parents often find themselves overwhelmed with “Baby’s first Christmas” gifts. Sophie la girafe skincare is ECO certified, and Vegan too. The Sophie la girafe starter kit is priced around £15, and contains small sizes of each product! My personal favourites from the range are the Body Lotion and the SOS cream, both are winter essentials in our household – both for children and me too! Cashmere fingerless gloves upcycled from old cashmere jumpers, they’re as fabulous as they sound! These are a go to gift for that friend who hasn’t quite got the idea that ethical and sustainable gifts are fabulous! I adore the fact that each pair is slightly different! Available at Nomads Clothing, along with many other gorgeous gift ideas. Scarfanista sell a cute fairtrade bag with a butterfly design, it’s a practical style which would be lovely for Spring! I own a small over shoulder bag from the same range, and it is very sturdy! I say sturdy as it has been overloaded, over loved and generally over used but still looks as good as it did when it first arrived in my wardrobe! Remember, that for a really Green Christmas, less is best! Buy gifts with care, and choose things people will love. Merry Christmas! A door wreath has always been a family tradition, and I love seeing them on doors in the neighbourhood at Christmas as they always look so welcoming! I’ve always wanted to have a go at making my own but never got around to it…until now! Hobbycraft sent me a selection of wreath making items to help me have a go at making my own wreath! I initially intended to go out and gather holly and ivy and make a traditional wreath but honestly the thought of being prickled by holly didn’t appeal! So, I opted for a more modern tactic and used an old Christmas tree trimmings to assist along with the lovely bits sent by Hobbycraft! What do you think? It’s currently hanging on our front door greeting all our visitors! It was so simple to attach things to the wreath ring, and the silver flowers look fabulous. I will definitely have another (more ambitious attempt at Easter – making an Easter wreath!). We were also sent a Kids Craft pack to make your own Santa, Boo has just tried this out tonight, so no photo until it’s dry but I will add it later! Disclaimer: We were sent a selection of items for the purposes of an honest review. Tired Tinsel – Super Simple Wreath! Having unpacked some Christmas decorations ready for next week, I found quite a lot of tired tinsel, but it seemed a shame to just throw it away! So, E and I decided to have a go at giving it a new lease of life! This is a simple make as E is 2 (almost 3) but needed help from me for any bits involving cutting out! Then take the tinsel and wrap it around the plate, we used two colours as we didn’t have enough blue! E really enjoyed doing this bit and I just had to help him secure it at the end. You end up with a basic wreath, then you need to decide how to decorate it, E is very keen on Snowmen and they’re so easy to make thankfully! Cut two circles of felt (or paper) one a bit smaller than the other, and a strip of coloured felt to make the scarf. We used double sided tape to secure the pieces into a snowman shape. 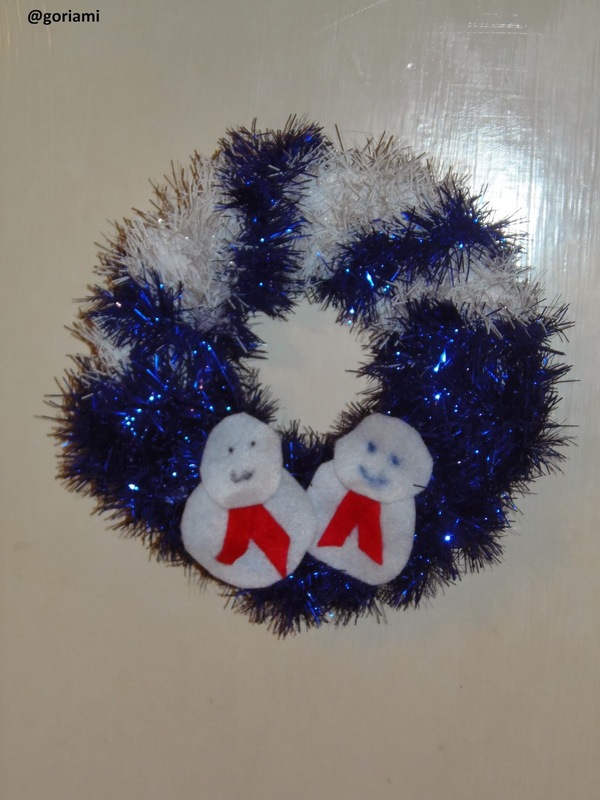 We then stuck them onto the wreath with double sided stick tape! Ready to stick on the boys bedroom door next week! What do you think? Have you got any great ideas for using up tired tinsel? Each year I try to think of fun things to do during advent, this year as the youngest is now big enough to know what Christmas is all about I can’t help but feel I need to try a little harder! I see adverts everywhere for all sorts of Christmas events, but most of them are costly and our budget wouldn’t stretch to them, plus I’m not sure they’re really what my children would enjoy the most anyway! So, I am compiling a list of Christmas activities we’re going to do during December – I’m hoping to compile a list of 24! Then I will add them to the advent calender! 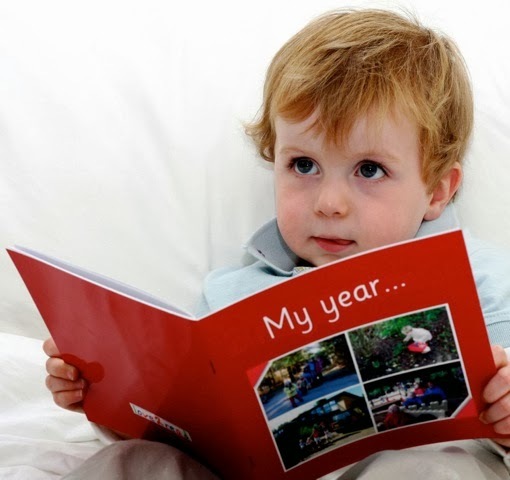 WIN a fabulous Personalised Book just in time for Christmas! I’m delighted to bring you another fantastic competition from Love2read! If you’ve never heard of Love2read, let me introduce you! 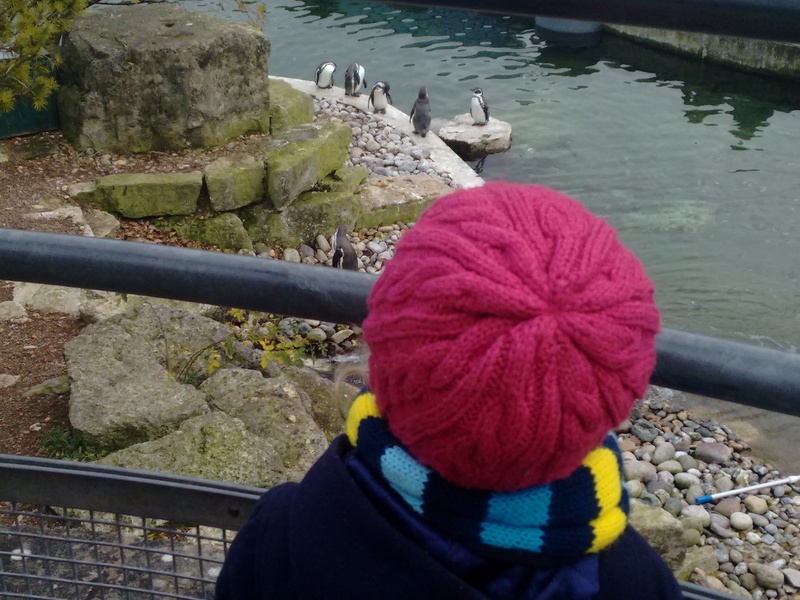 Have you a reluctant reader who is struggling to concentrate on those books from school? Or perhaps a very keen reader who you want to encourage? Then love2read is for you! Love2read puts your photos into a book and relates them to simple words! My sons love their “holiday” love2read book which we got last year, and the eldest (aged 5) now reads it to his little brother. The books were designed by a mother, who also happens to have fifteen years worth of teaching experience and created the first love2read book to help her middle child who has special needs to learn to read. I think they’d make a lovely Christmas gift, and would be ideal to share with family over the festive season to show how much fun reading can be (and share some lovely photos!). 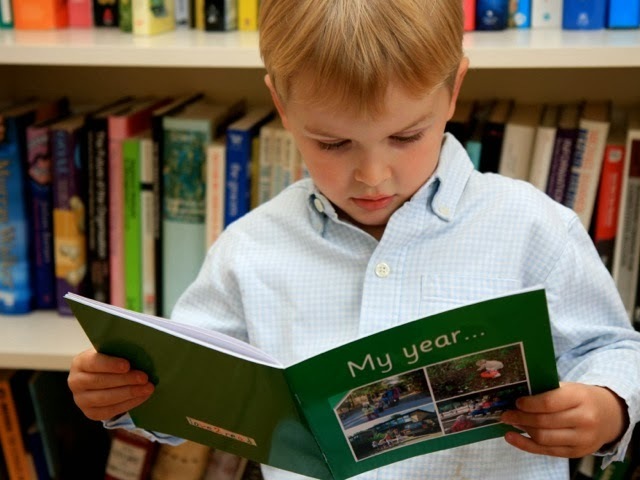 To make a book you need to select 10 photographs, and you are then able to add simple words. Books are usually printed on a Wednesday morning, and normally arrive within 10days! The last order date before Christmas is the 17th December 2013, although obviously the earlier you order the longer you have to wrap it up looking pretty! Love2read are giving one lucky reader the opportunity to create their very own personalised Christmas book for Christmas! Please note, while best endeavours will be made to ensure the winner receives their book before Christmas, we cannot be held responsible for any deliveries which do not arrive on time. Like many families, our budget this Christmas is tighter than ever. I feel disorganised as I’m not as well organised as normal, but I have made a start on the shopping and the Christmas lunch is ordered and paid for from our November budget! The good thing about it being cold is that the boys are happy to eat stews, soups and jacket potatoes – these are all fairly cheap to make and therefore saves me money on the food bill! Pretty cool even if I do say so myself! The good thing about making these baskets up ourselves was that we only added things we knew people liked and the boys got involved in decorating and filling them too! Yesterday I popped out to Lidl and stocked up on cellophane, they have it on offer at the moment for 99p a roll, it’s not the strongest, but works well enough! Ribbons and tissue paper I collect throughout the year, i collected three new packets of tissue paper from a charity shop for 50 pence a couple of weeks ago much to my delight, so it’s worth keeping an eye out! 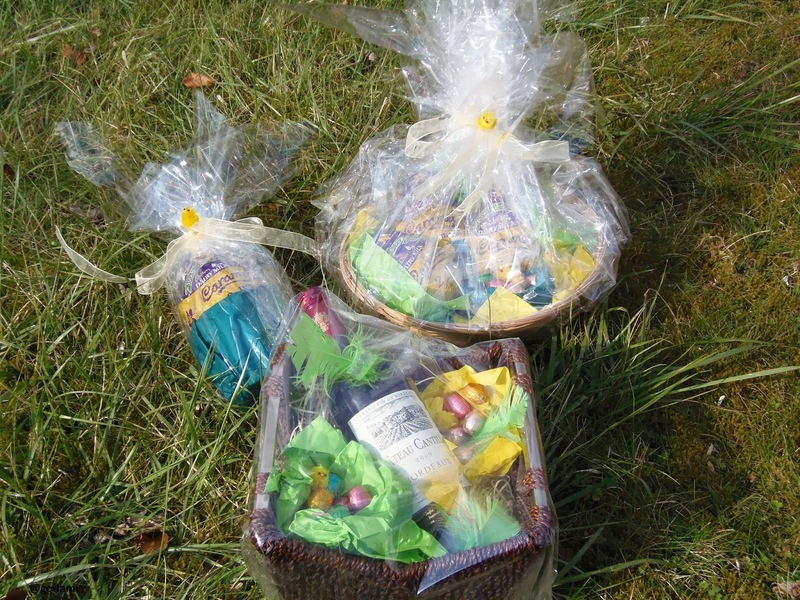 You could use tinsel or old tree decorations to adorn your hamper. No basket? No problem, an old cardboard box will do the job! I’ve used old sheet music to decorate an old shoebox which looked fabulous! The Baileys’ was a sample they were giving away a while ago, the socks I purchased in the sale in July for 50pence, the hot chocolate was free with the Telegraph (which was free from Waitrose as I spent over £5 on groceries and used my Mywaitrose card..!) the face mask was £1 and the love hearts cost about 50pence. So, what do you think? Coming in at under £2.50 including wrapping, it looks rather pretty and is especially for the individual it’s been made for, I just hope they’re not reading..! Crazy Soap – Shake & Sparkle and Colour Changing Bath Foam Review and Competition! Kids Stuff Crazy Soap offer fun bath products which make bath time entertaining for you and your little one! From foam soap which can shaped and bounced, bath goo which is yukky to squidge (but fantastic at cleaning grubby knees!) there’s even bathtime body paint which my sons love to use writing their names on their tummy before washing it off, in simple terms it’s all good clean fun..(pardon the pun!). We were sent Shake and Sparkle Bubble bath, bath foam and Colour changing bubble bath to try out! The bottles arrive with little foam finger puppets on top of the bottles which are ideal for entertaining little ones while you’re running the bath and are ideal for bath time play. Top tip the puppets also work well to encourage my sons to get out of the bath – which is usually a struggle! Shake and Sparkle pours easily and be warned you only need a small amount to create a huge amount of super soft bubbles! My 2yr old was delighted by the bubbles and announced that they sparkled like snow, it was an instant hit! The sparkles give a festive feel to the bath, and I have to confess I have been using the bubbles in my bath too – they’re that lovely! The products are gentle on skin, and I they’re made in the UK! Colour changing bath foam, this is a bit of magic which my 5 yr old thought was fantastic! You pour a small amount into the bath and watch as the e.g. orange bath mixture magically turn the bath water blue! These are also good fun if you do any water play with your children, and I can see us having fun with the paddling pool next summer using the colour changing bath too! You can win a bottle of Shake & Sparkle and Colour Changing Bath just in time for Christmas! Follow the simple steps on the rafflecopter widget below! Disclaimer: We were sent the products for the purposes of review, all opinions are my own honest thoughts of the product.